In I Am Romeo & Juliet, Joel Isaac Rivas recounts a queer young individual’s journey of self-discovery using the story of Romeo and Juliet. As Shakespeare’s play unfolds we begin to realize that his/her genderqueer identity carries the spirit of both Romeo and Juliet. The family feud and disapproval of the two star-crossed lovers compares to his/her divided “families:” the straight and LGBTQ communities. The question: will he/she succeed where the two lovers did not and escape or will he/she befall the same tragic ending? Here, author and performer Joel Isaac Rivas discusses how the story of Romeo and Juliet prompted this exploration of love and what it has been like creating a one-person play out of life’s experiences. “This production of Romeo and Juliet expresses love in a different form and it’s the most important love we all need; loving ourselves. I personally identify as genderqueer and, growing up, I read and watched Romeo and Juliet. Their love was truly beautiful and inspiring and I thought to myself, where is that love for me, especially because I’m not heterosexual. How could I find that love? As I matured and developed into an adult I found that I carried the same love that Romeo and Juliet had within my genderqueer identity because it’s an identity that isn’t fully understood or accepted by straight, gay and even sometimes drag communities. So this play takes place in a semi-fictional world where gender codes need to be obeyed, or else… The audience will experience what it means to love oneself when society is against one’s identity. 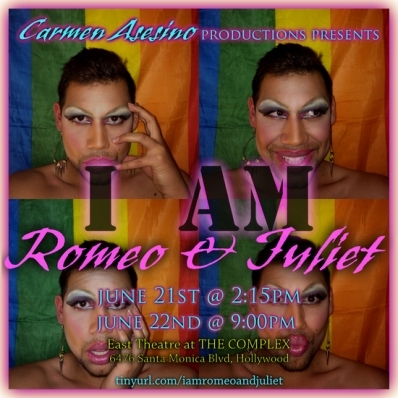 I Am Romeo and Juliet not only carries my own voice to illustrate the story but I also incorporate drag art forms such as lipsynching and Shakespeare’s own words to support the message that I am trying to put out in the world. The Hollywood Fringe Festival is, indeed, the place for a brave one-person show such as this. Welcome to the community.